While this post is sponsored by Target, all ideas and opinions expressed here are my own. Kids are already out of school (funny how already I pay attention to this now that I am a new mom!) and it’s time to pack and get ready to go on a vacation. Or maybe you decided to stay close or drive a few towns over – road trip! 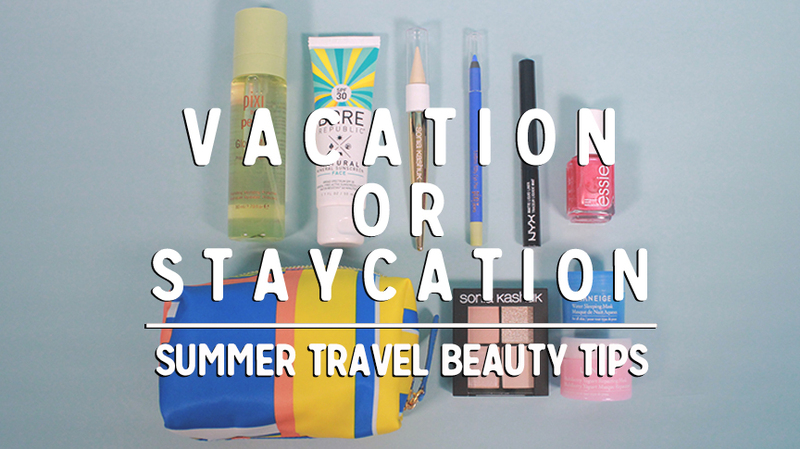 In today’s blog post, I wanted to share some of my travel beauty tips and products to keep your suitcase light and your day-to-day hassle-free. Let’s talk about hair! When I am out and about on a new adventure, especially during the summer, I want to keep my hair up and away, and as low-maintenance as possible. If you didn’t know, I have curly, wavy, thick hair; normally, I would need to bring around a hair dryer and an iron, but those things can get heavy. Normally, I just hope and wish that the hotel we are staying at will have a dryer and I will pack the shampoo and conditioner and some styling goods. I don’t want to risk using the hotel shampoo and having my hair dry out, so I am going to transfer some Hair Food goodness into smaller containers to take with me. 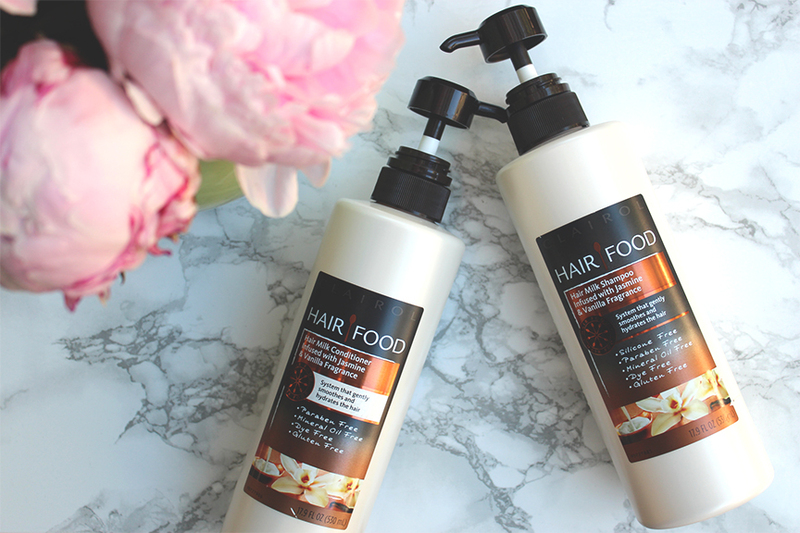 I know I can rely on the sweet-smelling product to keep my hair soft and under control because this shampoo really hydrates without parabens, silicone, mineral oils and dyes. It keeps my hair looking and feeling healthy. Hair tip number one: With damp, clean hair (add styling product if any), I will either braid or twist my hair into mini buns and go to bed. That way, in the morning when I unravel these babies, I have luscious, bouncy hair. 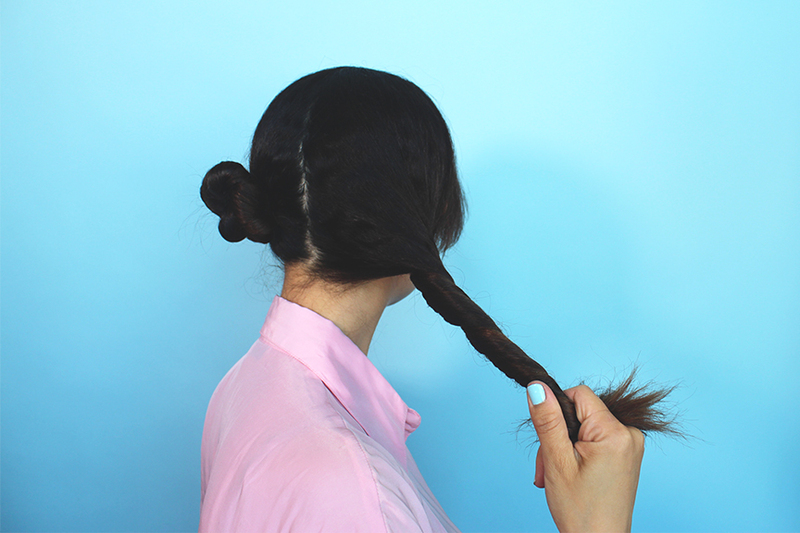 If you want more of a wave, you can braid them instead. Also, depending on how tight the hair buns or braids are, the texture you created for your hair will change. 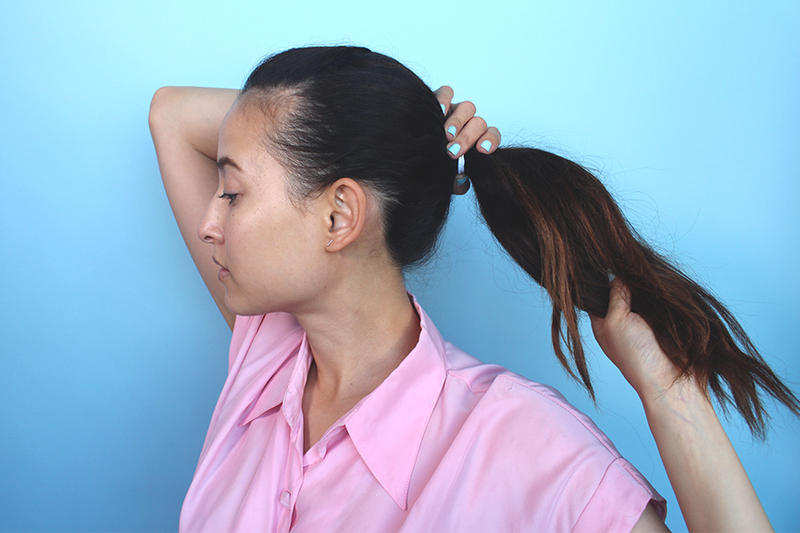 If the day does get really warm or hot, pull all your hair to the back for a ponytail. I used these hair ties and hair pins. Another trick: Hide the hair tie for going out at night. 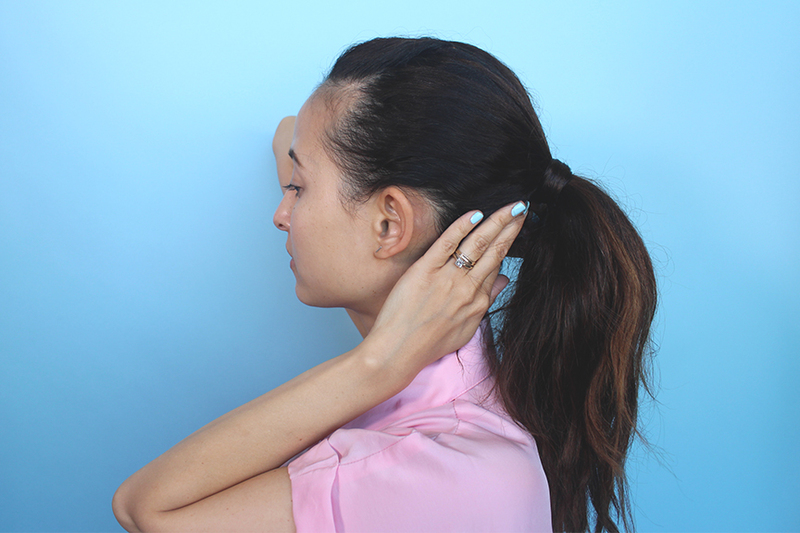 There’s something about hair ties showing that suggests a daytime look. 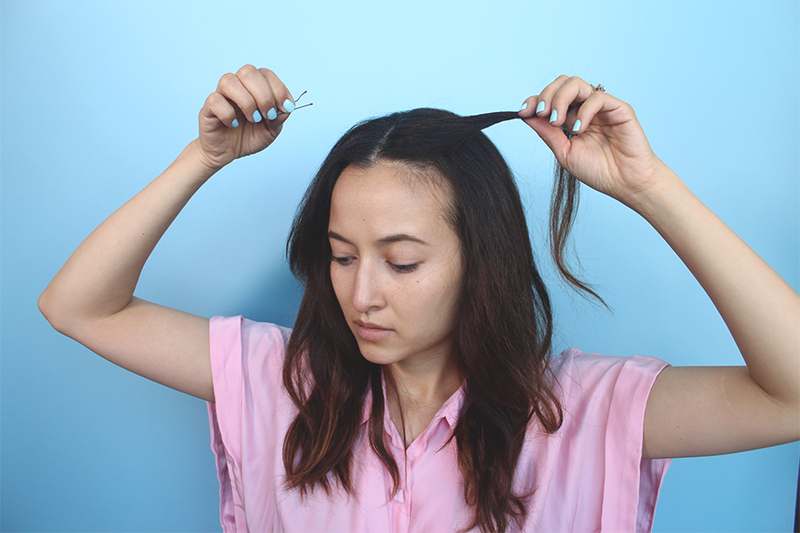 What I do is take a portion from the bottom of the ponytail, twist it around the top of the hair tie and pin the remaining hair on the bottom side, hiding the hairpin away. Before I begin, I am going to repeat myself in every beauty blog post and video I create: Never forget your sunscreen!! Especially when you are traveling, you want to use something you are familiar with on your skin and face. My new favorite has been the Bare Republic Mineral Face Sunscreen Lotion SPF 30. The smell and soft consistency of this is awesome. It really works well as a base for your makeup, and doesn’t leave your face feeling greasy or oily. It’s an amazing chemical-free active sunscreen that was made in California! You will spot me talking about this in my monthly favorites for sure. P.S. On the back of the bottle it says that this size is TSA-safe and perfect for travel. No 1: Bring a quad or a small eye-shadow pallet you like, such as this awesome Sonia Kashuk Eye Shadow Quad in Shimmering Sands. Perfect colors for everyday; use the bigger sparkle for nights out. Use the other golden tones as a base all over your eyelids. The shadows are beautiful and blend wonderfully. No 2: You have been traveling all day and you have decided to go out to explore the city, but you want to hide that your eyes look tired. Use this Sonia Kashuk® Dramatically Brightening Kajal Gel Eyeliner. White eyes will appear brighter and illuminated with the help of this kohl liner. You can use it on the waterline because it won’t irritate thanks to the rose and mimosa waxes that are in this unique-looking liner. I use mine on the inner corners of my eyes for an instant pick-me-up, or, since the whole kohl stick was out, I rubbed it on the top of my cheekbones! No 3: : Need impact? 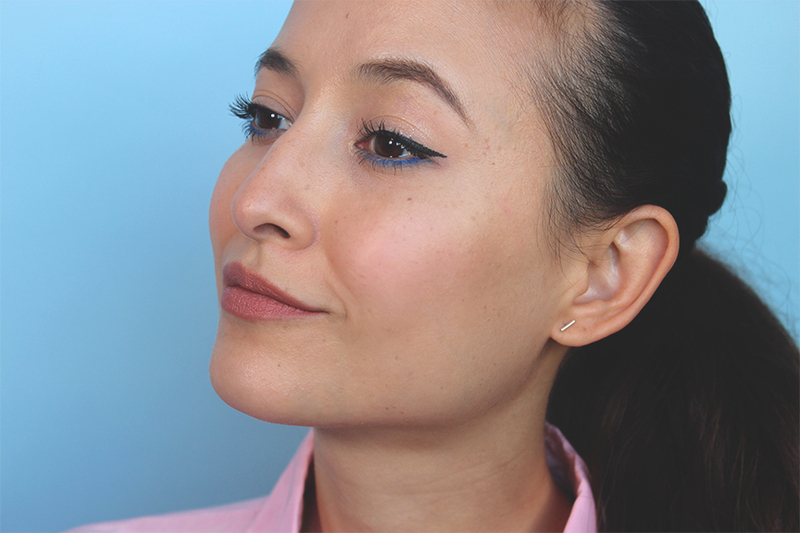 Use a color liner! This year’s fashion runways were all about the color liners. I found a great color (very pigmented) from Pixi Endless Silky Eye Pen in cobalt. This eye pen is super soft, and the color comes out nicely. I know it can be frightening to use a color, so maybe start off with complementing colors! Opposites attract: For my brown eyes, blue hues like purple, lavender, pink, turquoise or gold/copper are great too. If you have blue eyes, try bronze, oranges or a rusty tone. Green-eyed beauties go with purple, gold, dark turquoise or maybe even hazel. If you are looking for other beautiful eye pencils, check out the range that Pixi has from the Endless Silky Eye Pen line! Glow Mist from Pixi by Petra is another favorite of mine for every day. Literally every day. Not gonna lie, I went to two different Target stores to get one of these, and they are always sold out. Buy it online at Target.com to save some time and gas money! Use it before you do your makeup to hydrate, protect and nourish. 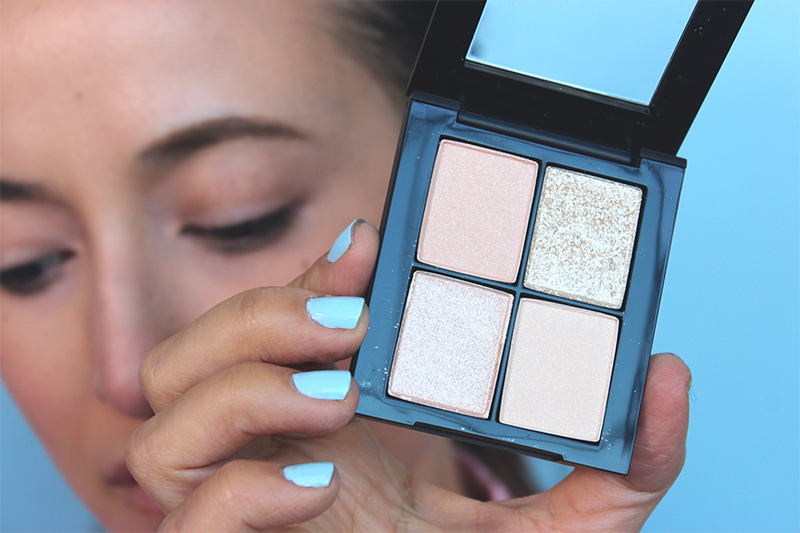 Use it again after to set your look and create a beautiful, dewy finish. 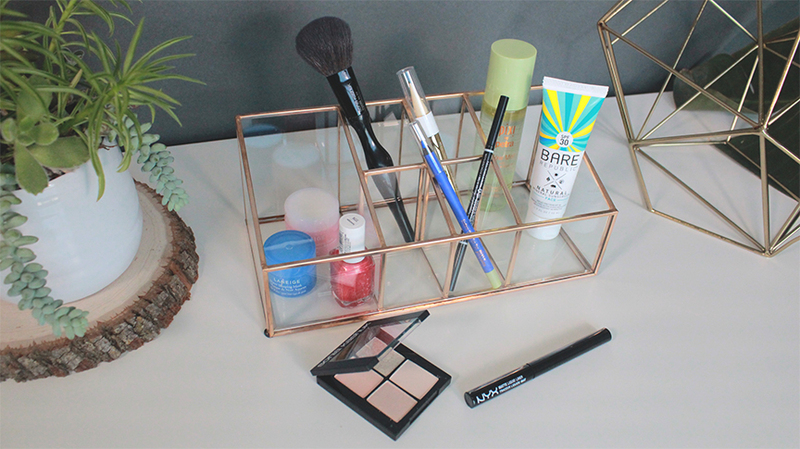 Or just anytime to refresh your makeup, hydrate and add some more glow. The best! 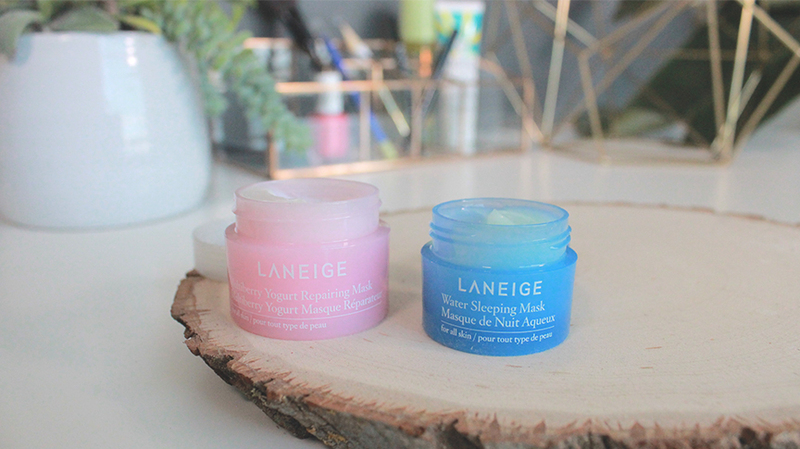 Other products I have mentioned before are the Laneige products from Korea – I absolutely LOVE the fact that you can get these at Target. During your travels, you want to keep your skin moisturized since you will probably drink less water than usual (it shows on your skin when that happens). The Laneige Water Sleeping Mask is a must, and it even helps you to sleep with the calming scent it has! Bye bye, jet lag. These cuties are from one of their many travel kits: Laneige Good Night Kit Trial Size. In the pink container is the Mulberry Yogurt Repairing Mask, a soft, sweet-smelling cream you place on your clean skin and rinse off after 5 to 10 minutes. It won’t dry your face, and your skin will be so soft you are going to want to use it every night! The blue container is my all-time favorite product from Laneige: Water Sleeping Mask. Use your toner, moisturizer and any other creams (eye, oils, etc. ), then place the Sleeping Mask over everything and when you wake in the morning rinse your face with water. Instant overnight pick-me-up! If you don’t want to commit to this amazing product, don’t make me force you. Try one of the other trial kits. You will not regret it! Here are some of the items mentioned along with other products I will be taking with me on our first family road trip this summer! 1. Pixi by Petra Glow Mist The best mist to carry with you while you explore new destinations. 2. Bare Republic Mineral Face Sunscreen Lotion SPF If you are looking for a chemical-free, lightweight sunscreen filled with plant-derived antioxidants AND cute packaging that’s Instagram-friendly, look no further! 3. Sonia Kashuk® Dramatically Brightening Kajal Gel Eyeliner The unique design of the gel eyeliner is easy to use in many ways. It’s a great little item to carry with you on the plane. Right before you land, use it around your eyes and you won’t look like you’ve been sitting for hours! 4. Pixi Endless Silky Eye Pen in Cobalt Pixi’s Eye Pens come in so many different colors. All of them are very pigmented and super soft to use around your eyes. Don’t worry, they come off super easy too! 5. NYX Matte Liquid Liner So many matte items are trending right now, and this may be one of them. The liquid liner brush is tiny and hard to make a mistake. 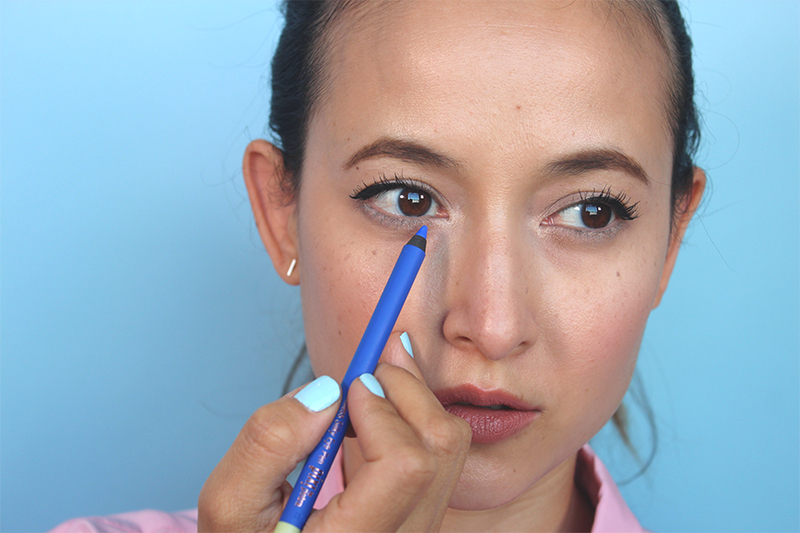 It stays on your eyelids all day, plus it’s super affordable. Thank you, NYX! 6. Essie® Nail Polish – Funships The new summer collection is pearly, beachy and mermaid-like! I chose the Funships pink color to give my fingertips some summer fun! 7. Laneige Good Night Kit Trial Size This is such a good little kit to have while you travel. 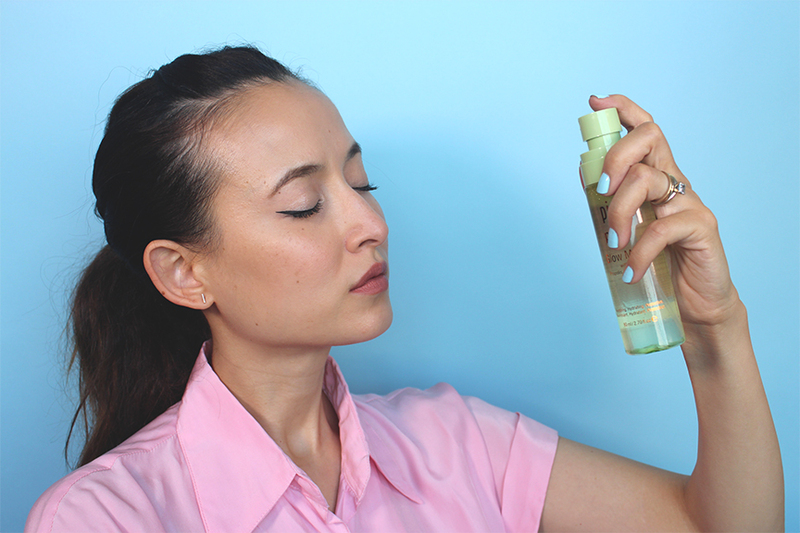 It will hydrate your skin so much that after you try the trial size you are going to go back to Target and pick up the full size. True story! 8. Sonia Kashuk® Eye Shadow Quads So many beautiful quad combinations. I chose the gold tones because I know I can use it every day, and I don’t want to overwhelm myself by carrying a huge palette knowing that I will only use the same 2 or 3 colors. 9. Sonia Kashuk® Soft Cosmetic Bag Sonia has so many cute makeup bags in so many sizes! This would be my carry-on, everyday size. It’s the perfect shape that fits just enough makeup. The pattern is adorable and makes me smile! 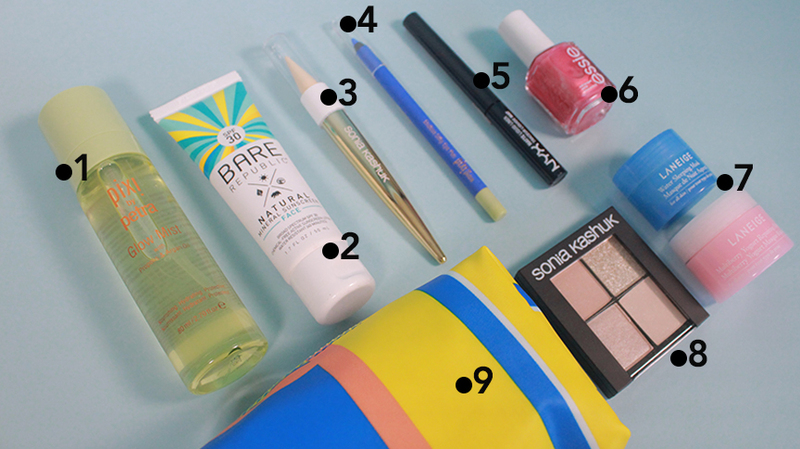 If you are looking for more of a carry-all makeup bag, she has those too! Another thing I want to say is that you can buy everything I mentioned and all your traveling goods (backpack, snacks, digital cameras, etc.) at your local Target or at Target.com. I hope everyone has the best time while out and about! Safe travels and hopefully I have helped on what to bring beauty-wise in some small way!